5.1 I can login to other servers but not the UNI server! 5.2 I can't enter a channel I should be able to! 5.3 "Server connection failed: The remote host closed the connection." 5.4 I continue getting the message "Server connection failed: The remote host closed the connection." 5.5 A referral was returned from the server. 5.7 Overlay not showing in Windows 8/Windows Server 2012. 5.8 Overlay not showing when you run Eve via exefile.exe. Mumble is a third-party VOIP (Voice Over Internet Protocol) application that allows people to communicate verbally both in- and out-of-game. EVE University maintains two different Mumble servers - one "private" and one "public" - as a way of engaging both students and the greater EVE community. Mumble is mostly used in two situations: PvP and Classes. In PvP it is very useful because, for example, it is faster to call out a primary target than to type it, especially with PvP related lag. In classes it is great as well because we do not want our poor instructors getting Carpal Tunnel Syndrome from typing everything. In effect, it is just a lot easier and faster than typing. At EVE University we have two separate mumble servers. We have a public server accessible by anyone; this is used for classes, Q&As, and the occasional CSM Town Hall. We also have a private mumble server accessible only by E-UNI members and alumni; this is used for all other E-UNI business - fleets, campuses, etc. Most E-UNI activities use the private server, only classes and Q&As use the public server. Download Mumble from http://wiki.mumble.info. Versions for many different operating systems are available. Install and set it up - starting Mumble for the first time will start two wizards, for certificates and audio tuning. See the FAQ if you have any issues. You must set a push-to-talk key - do not use voice activation. A more detailed guide to set-up and troubleshooting is below, along with how to get the overlay to work. When you reach a screen that looks like the one above select the top radio button, click on the box on the same line and press the key you you want to use as the push-to-talk key.This is your normal push-to-talk key; for certain Fleet roles you may need more than one (see the comments in the Fleet channels), but for general E-UNI activity one is sufficient. When you reach a screen that looks like the one above, it is recommended that you disable the text to speech notifications. Once Mumble is all set up and you have run through the Audio Tuning Wizard, you will want to connect to the EVE University server. Go to Server in the toolbar --> Connect. Click the Add New... button in the bottom right. Put anything you like in the Label box ("EVE University" seems sensible), the Address box needs to be voice.eveuniversity.org and the Port needs to be left as default (64738). The Username box needs to be your exact E-UNI forum username, which also happens to be your exact character name. The server will reject your connection, and prompt you with a Wrong Password box. You need to use your forum password (i.e. the same password you chose when you registered for our forums) in the box, then click OK. Please note that if you just recently created your Forum account or changed your Forum password, then it will take a few hours to update before Mumble recognizes your password. Try again after a few hours and you will be connected to the Mumble server, which will have moved you into the Public Lounge channel. To check your microphone is working and to hear what you sound like to other people, you can use the Comm Check channel at the top of the channel list (where the "user" Aura is located). Right-click the Comm Check channel and select Join to switch to it. Wait for your Echo to also join the channel. 2 seconds after you release your PTT key, your Echo will repeat what you said back to you. When you went through the wizard set-up, you may have left the microphone and speaker choices on "default." This is a normal thing to do, and it means that mumble will send sound out through your normal speaker, and listen on your normal microphone. For many players this will work fine. If the sound is coming from the wrong speaker, though, like for example your computer speaker instead of your headphones; or if your voice is not coming through clear and strong when you do the microphone check, you may want to change those default settings. To change microphones, click on Audio Input. 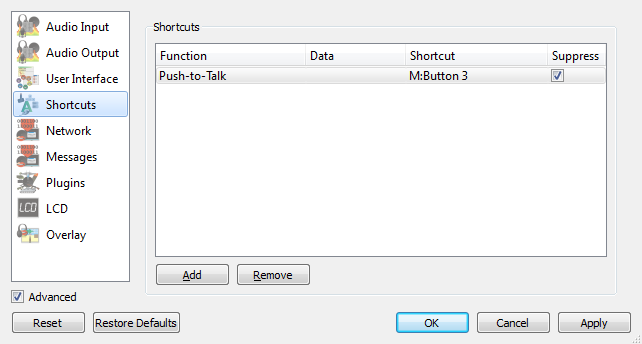 This is the first item in the Preferences, and is also the page where you set the Push-To-Talk key. At the top of the page is the word "Device" and next to it is a menu list of all the audio input devices connected to your computer. These may have strange names ... mine are things like "USB Audio CODEC" and "Mic 96K" ... so you may just have to click each one and do the microphone check to pick the one that works best. 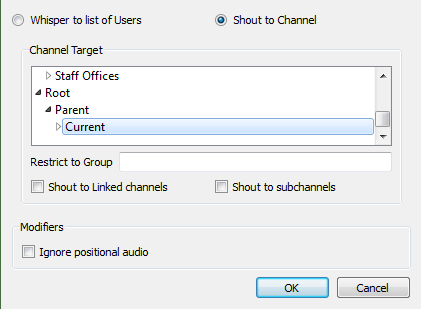 To change speakers, click on Audio Output. Again it says "Device" at the top and there is a menu list. There should be at least two devices on this list: your computer's speakers, and your headphones. If you're not sure which is which, try each one with a microphone check until the sound comes out where you want it to. Note: if you want to listen to Mumble through your computer speakers, the slider labeled "Attenuate Applications By..." will reduce the sound of the EVE game (and any other apps that might be running) by the percentage you choose - but only when Mumble is active. This lets Mumble talk stand out from the sounds of combat and such. Most of the classes are held on the Public Mumble server in order to provide knowledge to the whole EVE community. The procedures for connecting to the public server are exactly the same as the procedures for connecting to the normal EVE Uni server (connect to server voice.eveuniversity.org), however you must input 64739 as your port instead of 64738. You will not be prompted for a password. Please remember that our Communications Policy applies in the Uni Mumble. Moderation can include muting and/or banning. Note that this can severely affect your participation in fleets, classes, and other activities. In the Configure --> Settings screen you can find Advanced settings checkbox in the bottom left corner. With it checked you can access the Messages settings. From there you can disable popup and sound notifications about events you don't care about. By default Mumble makes a loud PING and gives you a notification popup for almost any event on the server - this gets annoying pretty fast. Mac version: From the Mumble --> Preferences window (make sure the 'Advanced' checkbox in the upper right is checked), select the 'Messages' tab. The only way to eliminate audio notifications is to uncheck items in the 'Soundfile' column. Some of our mumble rooms, most notably the fleet and campus channels have sub channels like command, logistics or ewar. The purpose of these sub channels is to give the group within the option to talk to each other without the rest of the fleet being able to hear it. For example the commander of the logistics group can now talk to only the Logistic pilots without confusing everyone else. You should already see your existing push-to-talk key set up. It's a good idea to check the Suppress box on any shortcuts, as that will prevent other applications from recognising your key and performing unforseen tasks you had not expected (e.g. warp scrambling stargates). Click the Add button in the bottom left, which will bring up a new Unassigned shortcut in the window. Click the word Unassigned and select Whisper/Shout from the drop-down list. Click the word Empty next to it, which should cause a [...] button to appear next to that - click that [...] button to open a new Whisper Target window. Make that new Whisper Target window look like this (i.e. Shout to Channel box ticked at the top, and Current channel highlighted), and then click OK. The Shout to Linked channels should be clear. Check Shout to subchannels if you want to be able to talk to the campus sleeper rooms (sometimes listed as "Ready Room"). Finally click the Shortcut column of your new shortcut and press the key you wish to use. You now have a Command chat key set up for fleet channels! These two channels in Mumble are linked. The Student Lounge is restricted to those people actually in EVE University; however the Public Lounge is open to anyone with an account on the EVE University Forums - i.e. any EVE Online player in the whole galaxy can join our Mumble server. The Public Lounge is where you can go while you're awaiting your interview to join EVE University and talk to Unistas in the Student Lounge. The Student Lounge is a place Unistas can go when not busy in a fleet or other Mumble rooms, such as Campus Channels to just relax, chat or help new Unistas with any questions. This is important when it comes to communicating information about University fleets or war information. Your normal push-to-talk will of course talk to both channels, and you should use that to chat in these two channels. However, the Student Lounge section serves an important purpose, and that is announcing upcoming fleets (or other confidential fleet/war information). Whilst in the Student Lounge you can use your Command chat push-to-talk key (Whisper Key) to talk to only the Student Lounge in order to announce upcoming fleets, or asking confidential questions concerning fleets or current wars. This should not be used for general chatting, and should only be used for fleet announcements or confidential war/fleet questions. Use of the command chat key in this case should be kept short and clear, as those in the Public Lounge are liable to talk over you. This is a sub-section of the Student Lounge where you can go when more detailed one-on-one assistance is required - particularly with Orientation questions. If you need some assistance, go to the Student Lounge or Public Lounge and ask if anyone's available to help you. There are often Orientation Officers available in the Student Lounge to help answer questions, but you will find other Unistas are willing and able to help in the absence of an Orientation Officer. The Orientation Lounge is available to anyone providing or receiving detailed assistance or Orientation. Please be mindful, however, if someone's providing Orientation or general assistance in the Orientation Lounge, do not enter and interrupt with general chat. The Student Lounge and Public Lounge are for that purpose. If you need assistance or you are a Unista helping someone else and you cannot do so effectively in the Student Lounge/Public Lounge as other conversations are going on, the Orientation Lounge is the place to go to discuss things privately. Another option with mumble is to set up so called tokens to be able to only talk to specific people. You find a detailed description with the example for ewar pilots here here (thanks to Remric for that). You can also set up keybinds to talk to groups of people, or to single specific people regardless of what channel they are in (we call this one a 'push-to-stalk' key). 2. Name the new token Ewar, logi, bombers, triage, and share this with your group. Mouse-over anyone's name and their ingame portrait will pop up. 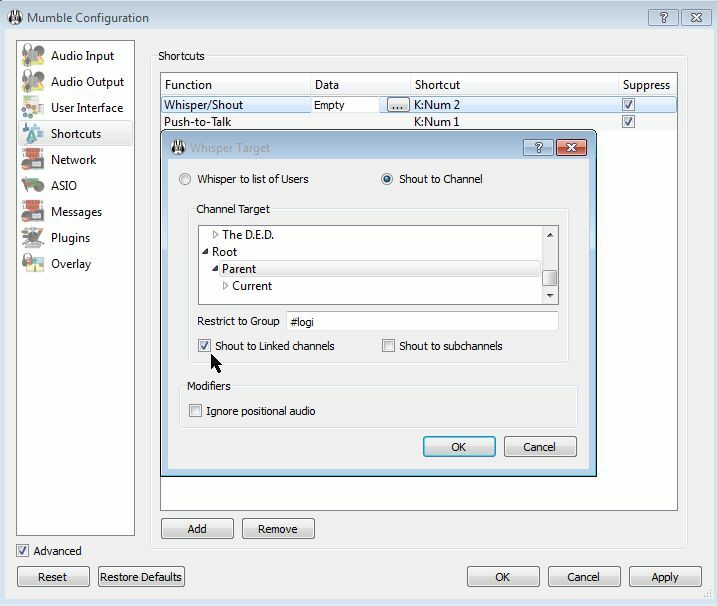 Right-click on a channel and select Join Channel to move to that channel (double-clicking sometimes produces strange behaviour with nested channels). If the name of the channel that you are in is italicized, then your push-to-talk button, in addition to talking to the current channel, will also talk to everybody in every other channel that is also italicized. Italicized names denote linked channels (you can only see this if you are currently in a linked channel). Click the small yellow |c| button on any channel (or any person) to see comments on that channel (or person). The |c| will go white once you've read it (and go yellow again if it changes). You can set your own comment by right-clicking on your own name. You can create your own channels for EVE purposes (in the On-Demand Channels section) or for any non-EVE gaming purposes (in the Non-EVE Gaming section) by right-clicking on the relevant section and choosing Add. These are temporary channels, you will have admin powers and once the last person leaves the channel will disappear. The overview will only appear if somebody speaks - so say hello if you cannot see your overview. Mumble provides a very handy and customizable overlay. To configure it go to Configure --> Settings --> Overlay option. Mumble, being the awesome program that it is, shows in this window an example of what the overlay will look like on your current desktop, as well as instructions on how to alter it. One position that works very well is just to the right of the current location name, like the screenshot on the right. You could even put it above the current location, but then - for me at least - it's too small to see easily. The default setting is for the Overlay to display the name of everyone currently in the channel. As you can imagine, this gets unwieldy very quickly. To change this, right-click on the small example overlay in the window, choose Filter >, and tick Only talking. Also untick Always show yourself, otherwise your name will constantly be displayed on the overlay. The Edit... option on the right-click menu produces a detailed configuration screen where you can change pretty much anything you like about the overlay: colours, sizes, backgrounds, avatars, etc. If your overlay is not showing up, it might be because you started Mumble whilst EVE was already running. If necessary simply restart EVE. If the overlay is still not showing, check the troubleshooting section below. The Mumble Overlay often doesn’t work on the EVE client with Windows 10 without some additional work. Many of the usual work-arounds won’t fix the problem. A reliable fix that is compatible with DirectX 11 can be done with the following two steps. Download and install the current Mumble Snapshot from http://wiki.mumble.info/. Use the Development Snapshot version instead of the Stable Release version and use the first listed (“Windows” -- Do Not use the “Windows x64” version). You can install the Snapshot version over your current version of Mumble. You don’t have uninstall the current version first. Next, put the location of the EVE client, “exefile.exe”, into the Mumble Overlay Whitelist. To find the Whitelist, open the Mumble Configuration (Menu: Configure/Settings or the Gear icon). Then select Overlay on the left side menu. Next select the Overlay exceptions and click on the Whitelist. Use the Add button at the bottom to add the location of your exefile.exe. The familiar Open File window will allow you to find the path, select the file, and add it to the Whitelist. 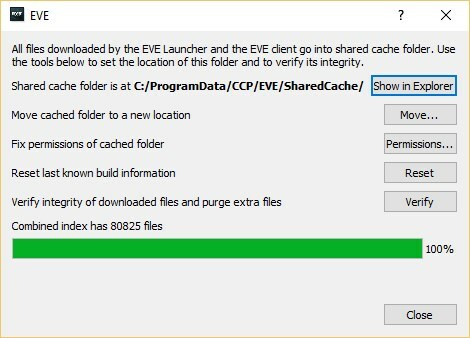 If you don’t know where your "exefile.exe" file is located, go to the EVE Launcher, open the dropdown menu from the top right corner, and select the Shared Cache option. The pop-up window will show the full path of the Shared Cache folder and the Tranquility exefile.exe will be located in the "\SharedCache\\tq\bin folder". The file might be located in the "ProgramData" folder which is a hidden folder. You might have to unhide it using File Explorer. If you want to add the path for the Singularity or Duality test servers, add the path that contains “\SharedCache\sisi\bin\exefile.exe” or “\SharedCache\duality\bin\exefile.exe” instead of "\SharedCache\tq\bin\exefile.exe". mumble-overlay wine explorer /desktop=EVE,1600x1200 "C:\Program Files\CCP\EVE\eve.exe"
WINEPREFIX=/home/username/bin/wine/wine-eve/ mumble-overlay wine explorer /desktop=EVE,3200x1180 "C:\Program Files\CCP\EVE\eve.exe"
The overlay in the 1.2.3a stable release works with Mac OS X 10.7 (Lion), but not with Mac OS X 10.6 (Snow Leopard). You'll need to install the developer snapshot from http://mumble.sourceforge.net/ to get a working overlay in Snow Leopard. In all cases, it is essential that Mumble be running before the EVE client is started for the overlay to work in EVE. 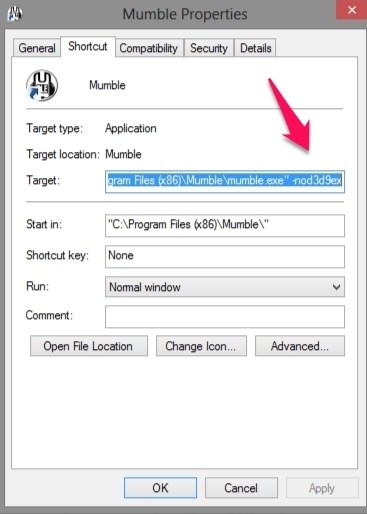 After downloading and mounting the Mumble install dmg, drag and drop the Mumble application into the folder of your choice. Click Mumble -> Preferences… and go to the Overlay section in the Preferences window that opens. Click the [Install Mumble Overlay] button. If prompted, authenticate using an account with Admin rights. The window will update once the overlay is installed. Tick the [Enable Overlay] checkbox if it's not already ticked. Click [OK] to close the Preferences window. Congratulations, you now have a working overlay! Well, kind of. You'll probably want to make some configuration changes. With the Mumble application still running, launch EVE. If you run EVE in full-screen mode, press the [Command]+[Enter] keys to put it into windowed mode. Switch to Mumble and click Mumble -> Preferences… and go back to the Overlay section. Move the red dot to anchor the overlay where you want it. Hover the mouse over the overlay and scroll in/out to increase/decrease the size of the overlay. Right-click the overlay and in the Filter menu check [Only Talking] (or [Talking and recently active]) and uncheck [Always show yourself]. Adjust other settings as desired. Right-click the overly and select Edit to customise the look of the overlay (e.g., background and font colour for the talk/shout/whisper). With Mumble running in the background, you can now switch back to EVE. Press [Command]+[Enter] if you want to put EVE in full-screen mode. Your overlay is now setup and you are ready to go! Again - be sure to start Mumble first before EVE from here on out. The Mumble FAQ on the Mumble homepage - http://mumble.sourceforge.net/FAQ - has a lot of useful information, and also has a section on Common Problems and Resolutions which may be helpful. I can login to other servers but not the UNI server! The Mumble download comes with a "backwards-compatible" version. That program won't work with our server. Use the up-to-date version. I can't enter a channel I should be able to! Mumble takes a few hours to update, so if you have just joined or left EVE University, or changed your forum password, it will take a while to catch up. Try again the following day and if it is still not working ask a Director for assistance. "Server connection failed: The remote host closed the connection." Third-party certificates (for example the free one from https://www.startssl.com that Mumble suggests using) do not work with the EVE University Mumble server. Create a new certificate from within Mumble and you should be properly prompted for your password when initially connecting. I continue getting the message "Server connection failed: The remote host closed the connection." Click on the Mumble menu: Configure/Settings and a popup window appears. Click on Network and be sure to UNcheck the [ ] Use Quality of Service (QoS) box. Now click Apply at the bottom right then click OK. The window will close and you will be connected to your server. "A referral was returned from the server." error while starting Mumble on Windows Check your system time. Windows certificate check will fail if your clock is some years ahead/behind. For Windows XP: Install the latest Root Certificate update through Windows Update (it's an optional update) to fix this problem. For Windows Vista/7: Right-click the Mumble executable, select "Properties", select the "Digital Signature" tab, click "Details" and click "Install certificate". Installing https://www.startssl.com/certs/ca-bundle.crt to the "Trusted Root Certification Authorities" cert store should also work. If you compiled Mumble yourself either sign the binary or disable signing. If you are on windows 7 and this doesn't help you, try this out. Press Start, type MMC and press enter go to File and select Add/Remove Snap-ins in available snap-ins select Certificates and press ADD. you get three options, I personally went with "My User Account"
with that done exit the Snap in management window and double click on the Certificate Icon, then double click on the "Trusted Root Certification Authorities" Right click on the Certificate icon that appears and highlight "all tasks" then click on the Import button. Option 1: If you want to keep using DX11, you can update Mumble to the latest snapshot release (snapshot link is to the right of the stable release). WARNING: Some people have experienced EVE client instability (Error message: "CCP ExeFile has stopped working") after upgrading to the latest snapshot. Now, if you have Mumble active and launch the game client, you should be able to see the overlay in-game. Overlay not showing in Windows 8/Windows Server 2012. Overlay not showing when you run Eve via exefile.exe. 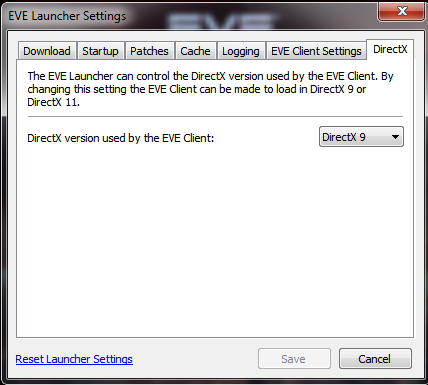 If you don't use launcher, but instead run eve via exefile.exe shortcut, Mumble overlay may still not work (launcher setting does not impact direct exefile.exe startup). The solution is to add "/triPlatform=dx9 /noconsole" parameters into your exefile.exe shortcut (just at the end of line in the Target field - after \path\exefile.exe). When downloading latest snapshot of Mumble you can choose between Windows or Windows x64 version. It is likely that even if you have x64 Windows you should install 32 bit version to get the overlay. The current file that seems to work is mumble 1.3.0~537 snapshot. Open sound settings, select device properties for the problem device, and click additional device properties. On the advanced tab uncheck "Allow applications to take exclusive control of this device". 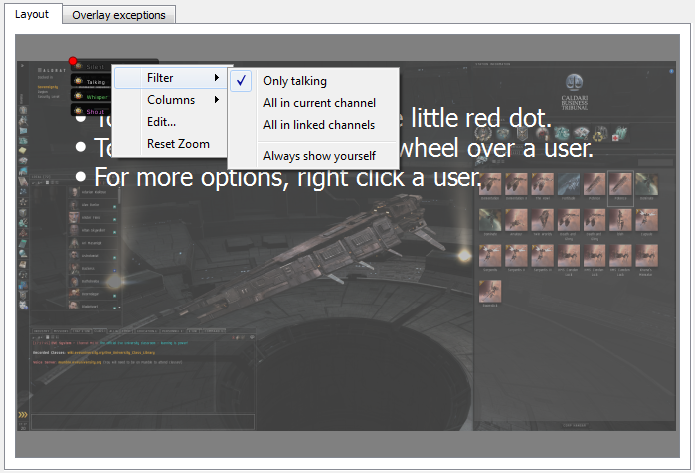 EVE Voice was the in-game voice chat functionality. CCP discontinued the feature in early 2018 due to lack of use and the amount of dev time it consumed to keep it functioning as patches, expansions and improvements to the sounds in EVE rolled out. On a short term basis, if Mumble should go down, during a time critical event/fleet/QRF, revert to using Fleet Chat, and using Fleet interface commands. Mumble service restoration will be a priority for Uni Management. This page was last modified on 2 March 2019, at 23:34. This page has been accessed 346,504 times.